Kingston upon Hull – or Hull, as it’s more commonly known – apparently has a drinking culture with a difference. Unusually pubs and wine bars are, from all accounts, more favoured by students than your average working adult, while the latter prefer late bars. At Taste the Cracklin Hog Roast, we can attest that this is not strictly the case. At least not last time we turned up to provide one of the many pubs with a good old-fashioned hog roast. There was a good cross-section of customers, from students to working couples, from young families to retired gentlemen, all with one thing in common. They were there to watch the match. It’s fair to say that a football match crosses the divides of age and gender, and a hog roast does the same. Few can fail to be impressed by the sight of our chef carving the slow-roasted pig while his assistant adds the meat into floured rolls piled high with stuffing and apple sauce. It’s communal food to beat even a barbecue, and since we also offer meat-free alternatives there’s no reason of anyone to feel left out. This inclusion is the reason that at Hog Roast Hull we offer more than just hog for roasting. We know that for a halal or kosher get-together pork is not acceptable, and so we also offer lamb, beef, chicken, and turkey as alternatives. In fact, we do our best to be flexible to meet the needs of all our customers. If you want an informal barbecue-style affair, we can give out our hog roast sandwiches on handy paper plates. For something a bit more varied we can do the roast alongside a buffet, which is always a popular choice for wedding receptions. However if that seems a little prosaic for a wedding, we also offer full sit down menus. With these you can have a choice of canapés, starters, sides, and dessert. All you have to do is bring the cake. At Hog Roast Hull we think one of the reasons our roasts are so popular here is because of the local love of food. Hull Global Food Festival brings cuisine from all around the world to the city, meaning that people are always trying new things. 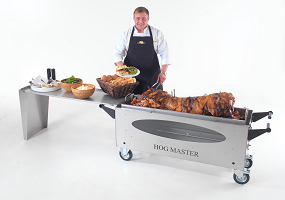 Hog roasting is hardly new – it’s been around since at least the Middle Ages – but it’s not something your average person will come across very often. It can seem quite daunting, when you see the whole pig through the glass front of our hog roast machine. It’s fair to say most people wouldn’t get more than a joint in their oven at home! This willingness to try new things is one of the reasons our roasts are popular in Hull, and why Hull is popular with us. It’s always amazing to see people appreciate something a bit different to the norm. It may not be global but it is timeless, and we hop to be serving Hull for a long time to come.